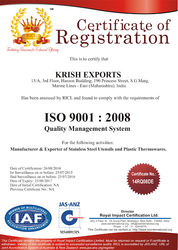 Established in the year 1998, we Krish Exports are ISO 9001:2008 certified name, which is engaged in manufacturing and exporting an unparalleled range of Stainless Steel Pot Set, Stainless Steel Steamer Set, Stainless Steel Strainers, Stainless Steel Colander and many more. Steel products offered by us are designed using high grade stainless steel and allied material, sourced from reliable sources of the market. In addition to this, the offered range is appreciated among the clients for its durability, corrosion resistance, high strength, easy cleaning, superior designs and functionality. Our quality experts make sure to inspect the entire range on number of parameters such as heat insulation & conduction. We have constructed a sophisticated infrastructure, which helps us in handling the business related activities in a streamlined manner. The facility is equipped with highly advanced machines and sophisticated technology that aid us in offering an unmatched range of products. Also the personnel hired by us categorize the premises in various sections to execute each business dealing smoothly and systematically. These segregated divisions are manufacturing, quality testing, warehouse and administrative. Owing to the quality based approach, sound financial stature and ethical trade practices, we are able to muster numerous patrons across the America, Latin America, Australia, UK, Middle East, Asia, Africa and Europe. Under the able guidance of our sales manager, Mr. Nikesh Rathod, we are able to place a firm foothold in this domain. His leadership attitude, innovative ideas and wise managerial skills have allowed us to gain immense appreciation from patrons across the globe. 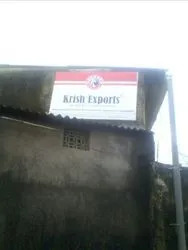 Krish Exports is a forefather Business Organization followed by their Sons. 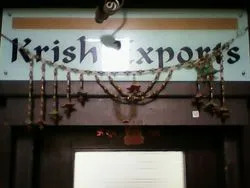 It’s a more than two decades old company which has made its Global Presence. Quality always remains an impeccable aspect, which aids us in raising our stature in this domain. Hence, we have constructed a sophisticated quality testing unit, which is installed with all the essential amenities that are needed for offering a defect free range of Stainless Steel Pot, Stainless Steel Steamer Set. The facility is handled by quality controllers, who ensure to check the entire range on various characteristics to ensure its compliance with the industry norms and standards. 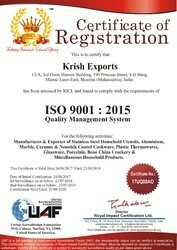 Also, we are able to acquire ISO 9001:2015 certification for our firm. At every Stage of Order, We keep you completely updated with the needy information through Email, Facsimile and etc. We have hired an apt team of adroit personnel, which helps us in dispatching an extensive range of Stainless Steel KItchenware, Petware, Aluminium Wares, Nickel Silver Wares and Plastic Thermowares. These experts are stringently hired. Personnel appointed by us ensure to maintain a prosperous environment inside the premises, by operating in proximity with each other. In addition to this, experts also make sure to understand the exact demands of clients, by keeping constant communication with them. We believe that taking responsibility for people and the environment is a prerequisite for doing good business. We work actively to reduce its impact on climate change and our products must be produced under acceptable working conditions. Every year, Krish Exports sets aside a fixed portion of its profits for Social Initiatives. 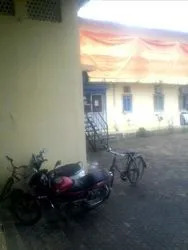 We support NGOs, Needy People and other Missionaries. We are an ISO 9001:2008 certified manufacturer and exporter of Stainless Steel Pot Set, Stainless Steel Steamer Set, Stainless Steel Strainers, Stainless Steel Colander and many more. These steel products are made using high grade material and latest technology in adherence with the industry laid norms and standards. Our personnel make sure to dispatch the ordered consignment at customers' premises within the committed time frame. To understand their demands of respectable clients, our personnel make sure to keep a constant communication with them.